If the result is not as specified, replace the fuel injector assembly. (b) Inspect the injector injection. Keep the injector away from sparks during the test. (1) Connect SST (fuel tube connector) to SST (hose) with SST (hose band), and then connect them to the fuel pipe (vehicle side). (2) Install a new O-ring to the fuel injector assembly. 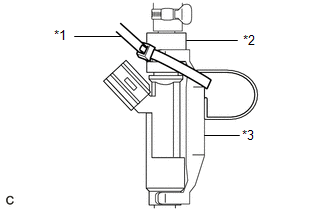 (3) Connect SST (adapter and hose) to the fuel injector assembly, and hold the fuel injector assembly and union with SST (clamp). (4) Install a vinyl tube onto the fuel injector assembly. Install a suitable vinyl tube onto the injector to contain any gasoline spray. 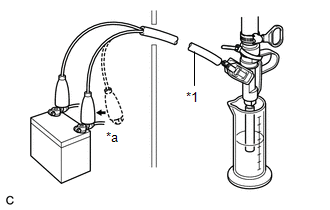 (5) Tie the clamp and adapter together with SST (tie band) as shown in the illustration. (6) Put the fuel injector assembly into a graduated cylinder. 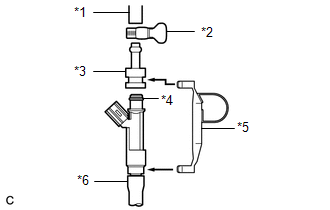 (7) Operate the fuel pump (See page ). (8) Connect SST (wire) to the fuel injector assembly and the battery for 15 seconds, and measure the injection volume with the graduated cylinder. 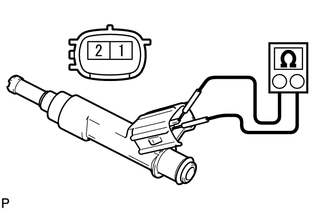 Test each fuel injector assembly 2 or 3 times. (c) Check for fuel drop. (1) In the condition above, disconnect the tester probes of SST (wire) from the battery and check for fuel drop from the fuel injector assembly. 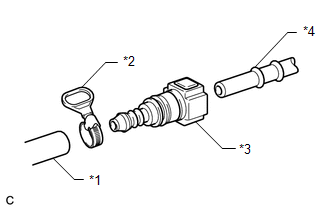 If fuel drop is not as specified, replace the fuel injector assembly.